When I moved three years ago, I lost my fly swatter. Every summer since then, when flies zoom in through a momentarily opened door and begin buzzing annoyingly around my ears and landing on fruits, vegetables, or other food in the midst of preparation, I put a fly swatter on the shopping list. Then I forget the list or can’t find the item in the store. 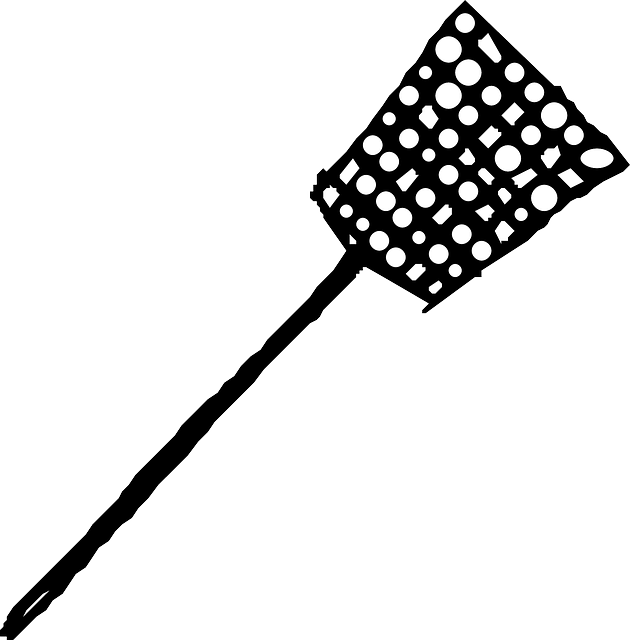 Of course, flies aren’t the only insect that can be exterminated with a swatter. Recently, a wandering wasp made it into the house and flitted from window to window, searching for a way out. I ducked for cover as he darted this way and that, almost hitting me as he swooped by. Opening a door for him to fly out didn’t work. It just gave additional insects a port of entry. Bonnie, my relentless writing friend, said I should spray the wasp with hairspray. I had my doubts, but she said it would coat him and cause him to die. The next day, the wasp buzzed past my head. I yelped and grabbed a can of hairspray. I whirled too quickly, stumbled over a book, and almost fell, all the while with my finger on the sprayer. I was happy that the only thing polluting the air was hairspray and not insect poison, but neither are good for breathing. Even with all my stumbling and flailing about, I was able to get some spray on the insect, but it only slowed him down. He managed to burrow between the venetian blinds and the curtain where I couldn’t get a clear shot. Obviously, I needed that swatter. While shopping that afternoon, I stopped at Dollar General. I didn’t have much hope because I had looked there two or three times in previous years. A quick tour of the store brought me to the same conclusion: no fly swatter. Just as I was winding my way around boxes of new products waiting to be put away, I happened upon a sales clerk who asked if he could help me. I asked if he had a fly swatter. He laughed. “I’ve been here four years and we’ve never carried them. But they just came in this order. I put them out twenty minutes ago.” He fetched one for me, and we headed for the checkout where a line was forming. While he was ringing up my purchase, I mentioned the wasp. A lady behind me cautioned about trying to kill it with the swatter. She said the injured wasp would release an odor which would cause his buddies to swarm after me. Luckily, my wasp was a loner in my house, so I bravely whacked him the next time he buzzed me. The previous hair spray contact had slowed him down and burrowing in the curtains did not save him this time. Besides being able to enjoy my home wasp-free, I have been reminded of a valuable shopping lesson: If you don’t see what you want, ask. The item might have just come in. This entry was posted in Nature and tagged insect extermination, shopping, wasp. Bookmark the permalink.